Analyzing Climate Change Language – ETCCC. Trump’s use of the word “hoax” involves more than simply a reference to a fabrication or deception. Trump’s “hoax” dismisses scientific research, the media, political opponents, previous government actions, global consensus and global agreements — and anyone who believes in or takes action to address climate change. “Hoax” reduces climate change to “fake news.” Indeed, “hoax” is part of a misleading and dangerous political rhetoric that diminishes our ability to confront the greatest threat to the planet. English teachers know language choices are important, and that our students learn a great deal by critically analyzing language use in social contexts. With a view toward their own future, young people need to consider the political aspects of climate change language, and ways that such language shapes action – and inaction. Trump’s use of the word “hoax” creates a pressing need for English teachers and students to intervene. And there are many other uses and dimensions of language in regard to climate change that need to see the clear light of the English language arts classroom. Another important, and complex word is “certainty.” The 97% of scientists who believe in human causation of climate change employ “certainty” in specific ways based on precise measurable criteria that take account of probabilities and margin of error. In contrast, the public, as well as the media, typically employ “certainty” more subjectively, based on an individual’s confidence, impressions, or associations. “Certainty” is important given that many people continue to believe that climate change is uncertain. The fossil fuel industry exploits misunderstanding about “certainty” through climate change denial campaigns that take advantage of “false balance reporting.” The tobacco and sugar industry also managed to make causal effects seem “debatable” by creating false balances, obscuring smoking’s effects on cancer and sugar’s on health. Many Republican politicians foolishly fan the flames of climate change denial, including those on the House Science Committee. The corporate media often fails to clarify the science. An analysis of nearly 2000 news media reports on the 2013 Intergovernmental Panel on Climate Change Assessment found that only 14% showed any awareness of different understandings of “certainty”. Rather than explaining scientific understanding, the media simply defined “uncertainty” with phrases such as “extremely likely” or “consensus,” or by making analogies or associations with the effects of smoking on cancer or the value of vitamin supplements to improve health. Public debate and the media offer many openings for students to examine climate change language. It is fascinating for students to examine climate change metaphors. Analysis of metaphors about climate change in newspaper reports in Germany, the UK, and United States, found predominate use of metaphors of illness, war, and journey (Atanasova & Koteyko, 2017). Metaphors have great rhetorical value, and create rhetorical complexity. Illness metaphors can evoke fear and, perhaps, turning away from the problem. 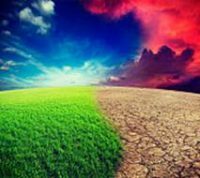 While war metaphors may call for taking up arms in active engagement, they frame climate change as a battle, with two opposing sides. Denialists have used the war metaphor to frame efforts to address climate change as a “war on coal,” without comparing the employment effects of dirty vs. clean energy technologies. (Clean energy employs far more people than oil or coal in nearly every state.) The journey metaphor implies taking sequential steps over time to reach a goal. A journey metaphor can also serve to point to impediments or roadblocks to making progress addressing climate change. As students in English or social studies examine discussion about climate change they should be mindful of how the terms from science, misused in popular discourses, can obscure impacts. So the “enhanced greenhouse effect” or “enhanced ozone depletion” sounds like a good thing. Try “intensify” or “increase” instead. “Positive” connotes good and “negative” connotes bad to non-scientists. So “positive trends” or “positive feedbacks” sound like good things. Instead of “positive trend,” try “upward trend.” Instead of “positive feedback,” try “self-reinforcing cycle” . Learning how scientists can improve their communication on climate change informs student how language can have different meanings in different discourses. Word choice makes a difference in the way climate change discussions are framed and understood. Terms like “frankenfood” shifted the debate about genetically modified crops, and “big tobacco” impacted the way people understood the actions of cigarette companies. “Big oil” works in the same way. “Inconvenient truth,” “Eaarth,” ecojustice, environmental literacy, “great derangement,” — all are terms/phrases developed to help reframe environmental thinking and address climate change. Examine and discuss how terms like “global warming,” “climate change,” “certainty” and “risk” are used and whether such uses are scientific or impressionistic. They can analyze author bias and the way that different points of view are expressed and amplified by word choice. Compare and contrast the use of language describing climate change from different websites, including denialist/skeptical, corporate, (those that cause, those that address), scientific, and activist (those that deny, ie, Koch Industries, and those that address). Analyze language employed on the Energy Tomorrow site http://www.energytomorrow.org/ sponsored by the American Petroleum Institute to promote use of fossil fuel. The site argues that energy from fossil fuels is “the power to create, shape, transform and animate. It’s part of every human endeavor, initiative and invention. Energy is freedom. It’s pivotal to improving the lives of the world’s most impoverished people. It’s essential to modern life. We depend on energy.” Missing in this description is any discussion of climate change and its implications for impoverished people, not to mention accelerating harm to all life on earth. Study “greenwashing,” the way that companies or organizations try to appear to be environmentally friendly, when, in fact, they are not. Greenwashing can focus around specific products or companies and students can analyze greenwashing language in advertising or on websites, as well as examining images and videos. Students can respond not just by writing analytical essays but by culture jamming or making their own subvertisements. Discuss what they perceive to be effective use of language in communicating about climate change. Students can review news reports and websites to identify valid, persuasive, and impactful language. They can draw on what they learn to generate their own messages through flyers, news articles, tweets, websites, blogs, or videos designed to communicate their concerns about climate change to larger audiences. Students don’t have to be scientists or experts to start writing in influential ways about climate change. Use of familiar language found in everyday discussion, popular culture, and the media have been shown to be more effective in engaging audiences with climate change than more formal political or policy discourse. Increasing students’ awareness about how language is used to mislead and persuade, to make evidence-based argument, to inform and empower – that is critical to good English teaching, and to understanding and making a difference with climate change. Atanasova, D., & Koteyko, N. (2017). Metaphors in online editorials and op-eds about climate change, 2006-2013: A study of Germany, the United Kingdom, and the United States. In K. Flottum (Ed. ), The role of language in the climate change debate. New York: Routledge.